I really love writing. Seriously. So much so that it almost feels a hobby because it doesn’t feel like work (shh, don’t tell my agent I said that!). I know how blessed I am to feel that way because so many people are in careers or situations they don’t enjoy. Contemplating that got me to thinking about my actual hobbies—which of course I don’t have nearly enough time in which to indulge. I started scrapbooking many years ago, after a woman in my neighborhood dropped off a card inviting me to a crop event at her house. Because I am a pack rat when it comes to memorabilia, I knew I had discovered the perfect hobby for me. I’ve made countless scrapbooks documenting my life. I guess it’s what was done before you could document your life on Facebook! It’s fun to go back through the books and see pages decorated with pictures and ephemera from trips and events. Goodness, I even have scrapbooks containing Christmas cards and letters that are sent to me. Right now, I’m working on a multi-volume scrapbook documenting my mother’s life. It really helps me re-connect with her even though she has been gone over 3 years now. For several years I made my own Christmas cards, and would even give sets of personalized cards to friends and gifts. Alas, I eventually found it to be too much work to keep up with. However, the rubber-stamping supplies work quite well with my scrapbooking supplies! I tried beading for a while. Literally everything I made fell apart because (1) I get too excited about beads and load pieces up with ridiculously heavy beads and (2) I was never good at judging the right size wire to use for individual projects. I’ve done a tiny bit of sewing but have never attempted more than a few straight lines. Like with a placemat. A friend helped me shorten some 84” curtains to fit a canopied bed I bought. I helped remove stitches and re-pin the curtains, but she worked the machine. It was probably better that way! Some crafts work for me, others don’t. I think a lot of the fun is in trying things out. 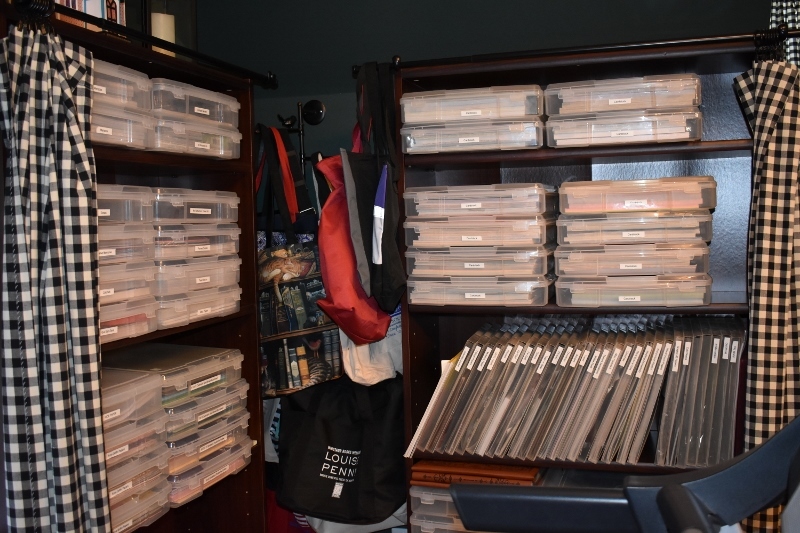 In the end, though, I think half of my fun is in organizing my supplies. 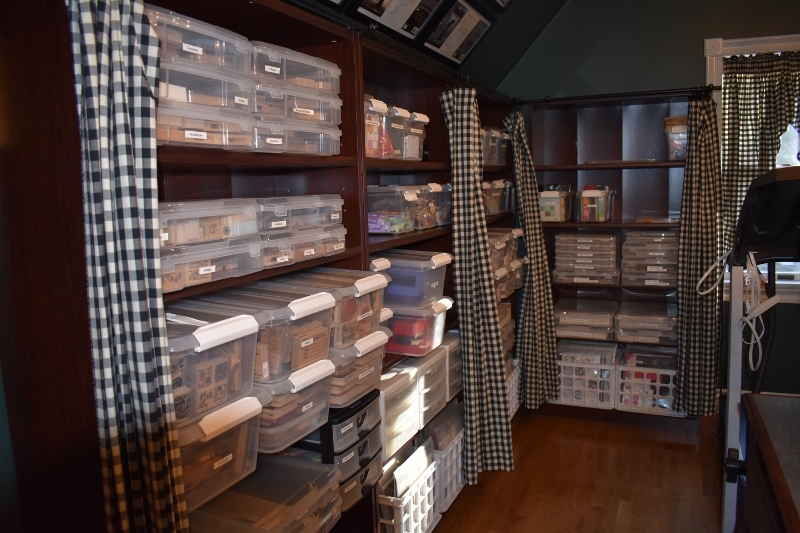 I hereby present to you my craft room! Do you enjoy any fun or unusual crafts? I’d love to hear from you about it. Jon built me this table—a 4’x8’ counter laid across some stock Lowe’s cabinets—and I can manage to spread across the entire thing while working a project, as you can see here. Plus Marcus needs room to supervise me! How daunting is this? These cases containing all of my waiting scrapbooking projects! All of these cases are full of cardstock. Why no, I’m not a hoarder at all! All of these papers are most necessary! Jon built this cabinetry into a window dormer for me. Naturally I need a coffee maker located right next to me to keep up my energy! 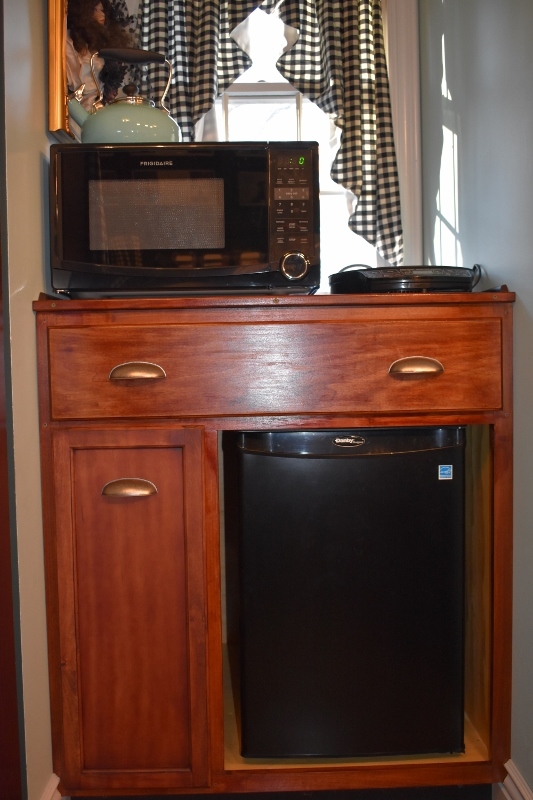 And if I’m going to have a coffee maker, don’t I also need a microwave, refrigerator, and induction plate? I can craft for hours on end without ever leaving the room. 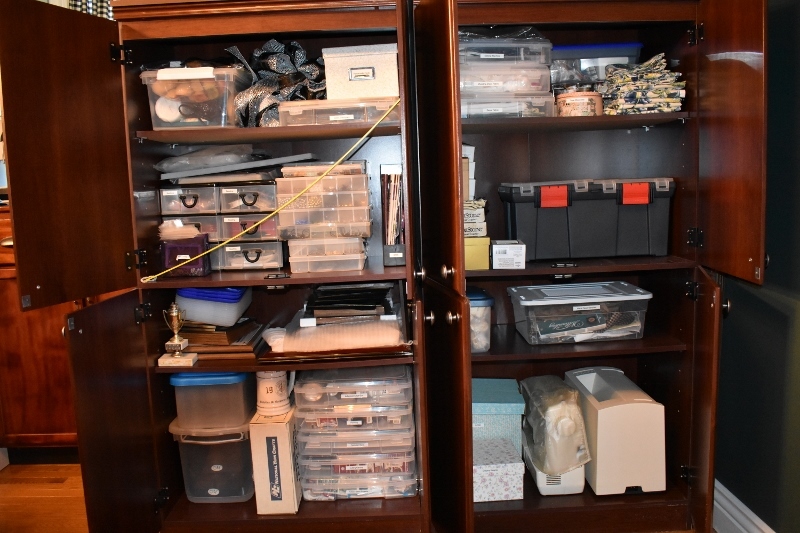 Everything not scrapbooking is in here: sewing machines and supplies, beading materials, paints, and so on. 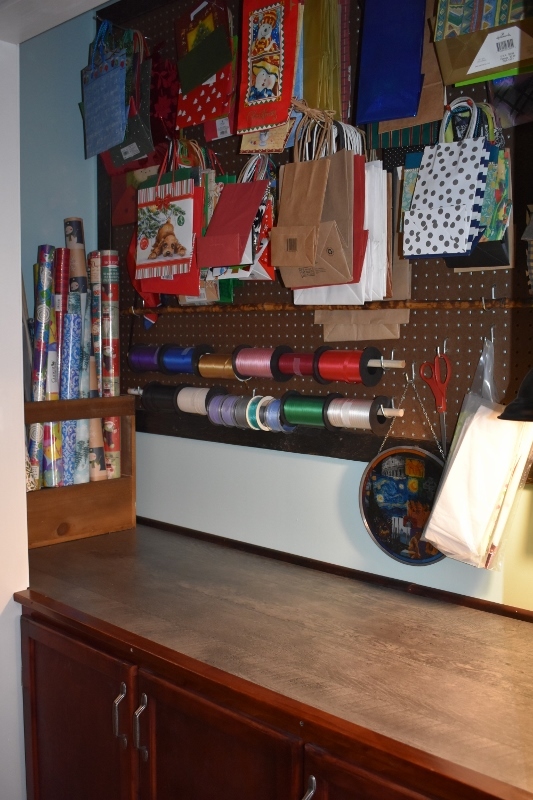 Jon built me this clever little gift wrap center inside my craft room’s closet. 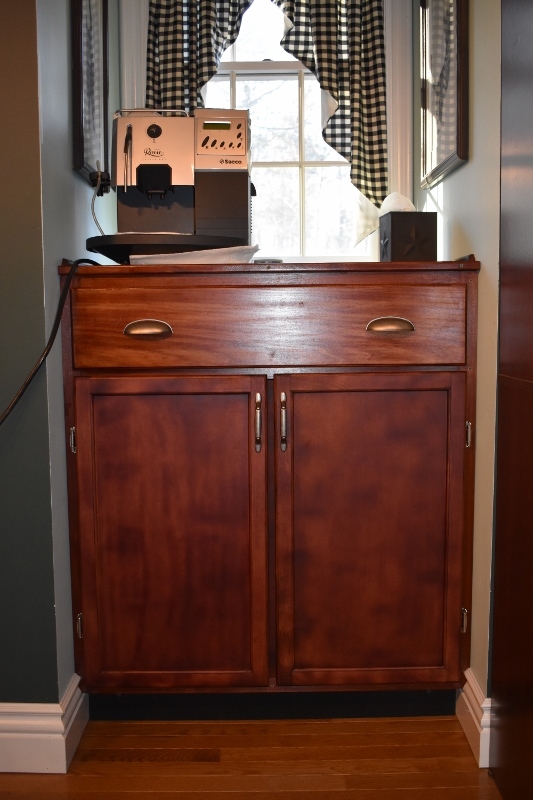 I adore this built-in, it’s very useful. 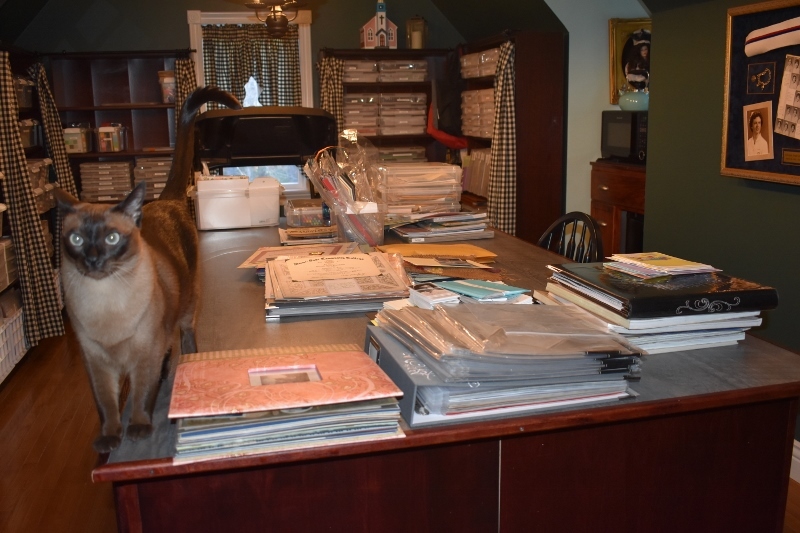 How many scrapbooking and rubber-stamping supplies does a single crafter need? Apparently, quite a bit. Thank you, Michele. I am very fortunate to have a husband who likes to build things! Thanks, Debbie. I do enjoy spending spare time here! I am so jealous! You are so organized! Haha, it didn’t always look this way, I assure you. 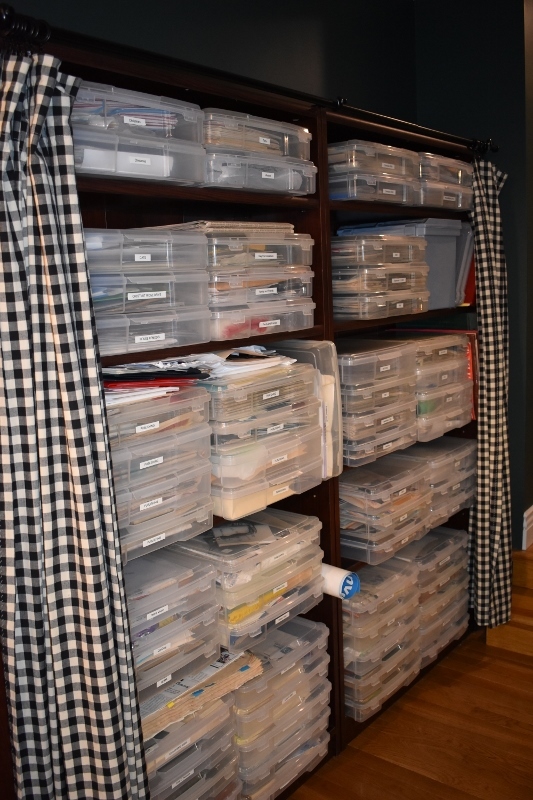 I’ve spent years collecting storage bins and doing periodic cleanouts/reorganizations. Thanks for stopping by, Jan.
We were visiting Leonardtown in January. Wouldn’t it be amazing to have a scrapbook store right next to the used bookstore. Then someone could open a quilt store next to the yarn shop. A pie shop and bakery that only makes bread would be heaven. I could go on and on. I jump between scrapbooking and sewing with reading a constant. There actually used to be a tiny little scrapbooking store in Leonardtown. Alas, it closed after about a year. Your idea for a bakery is a delicious one!!! It needs to be next to the chocolate shop. Yum! One of these days I’d like to really learn how to sew. I even bought a video course on sewing, but haven’t watched it yet. Christine, you have done a beautiful job! Everything is so well organized. Love the idea of scrapbooking but I’ve never really done it. That’s a great thought to prepare one of memories of your mother. Well done! Thank you, Jessica. I just wish I had more time to devote to scrapbooking! What I like about it is how calming it is. I forget about everything when I’m head down in a project. Hope you have the opportunity to try it someday.